PG7102 covers gauge and absolute pressures above atmosphere with gas as the pressurized medium. Absolute mode is supported by automated measurement and addition of atmospheric pressure, using PG7102’s internal barometer or any external barometer supporting RS-232 communications. PG7102 does not cover absolute or gauge pressures below atmospheric pressure. Simplified gas operated platform does not include vacuum reference capability. Accepts same gas operated piston-cylinder modules as PG7601 platform. The PG7000 Series calibration standards are based on the fundamental principle of mass loaded onto a piston to apply a known force to a known effective area. Maximum pressure ranges Actual range depends on piston-cylinder and mass set selection. Note: DH200 and DH500 are gland and collar type fittings for 1/4 in (6 mm) coned and left hand threaded tube. DH200 is equivalent to AE SF250C, HIP LF4, etc. DH500 is equivalent to AE F250C, HIP HF4, etc. Mass set specifications All masses are delivered in molded, reusable transit cases with custom inserts. 1 Sensitivity: The smallest variation in input detectable in output. 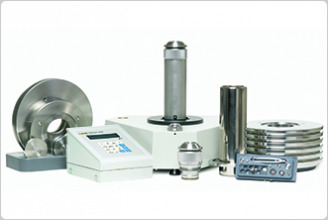 Manual 100 kg mass set is typically used when AMH is not purchased. Smaller mass sets are available when maximum pressure range is not required. Delivered with reusable shipping and storage cases and calibration certificate. See AMH-100 and AMH mass sets for automated mass handling options.